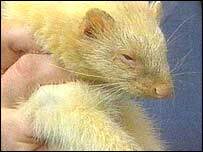 A ferret was forced to survive on a diet of stale beer after being dumped in a recycling bin. RSPCA officers said the animal, christened "Tetley" after his ordeal, could easily have died. He was rescued from the bin off Fryston Road, Castleford, West Yorkshire on Sunday by a member of the public who heard his squeaks for help. RSPCA collection officer Jan Parkin said Tetley was "wobbling around, a bit drunk, and not very happy" when she took him to the Leeds Animal centre. She added: "Whoever abandoned Tetley didn't give a thought for his welfare. He could have easily died in the recycling bin." Pink-eyed Tetley is now recovering in the centre with plenty of rest and water to help him get back on the mend. The RSPCA hope he will eventually be re-homed.